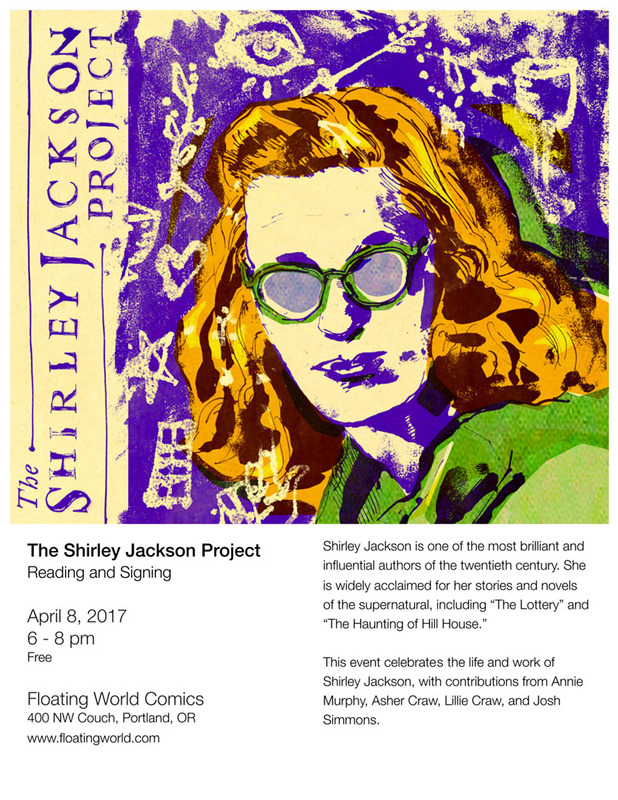 Ninth Art Press announces The Shirley Jackson Project: Comics Inspired by Her Life and Work, a new anthology of seventeen alternative cartoonists paying tribute to the celebrated mid-century author. Join us on Saturday April 8th at 6pm for a book release party and reading with Asher & Lillie Craw, Annie Murphy and Josh Simmons. The book features a diverse roster of notable cartoonists, including Ignatz Award-winner Colleen Frakes and Ignatz nominees Annie Murphy, Eric Orner, and Josh Simmons; Lambda Literary Award-winners Jon Macy and Robert Triptow; Xeric Grant-recipient Ivan Velez, Jr., and acclaimed artists Asher Z. Craw, Michael Fahy, 2dCLoud co-publisher, Maggie Umber, as well as Ninth Art publisher himself, Dan Mazur. Included are riffs on famous stories and acclaimed novels by Jackson, including Frakes’ amusing account of her somewhat traumatizing encounter, at a young age, with the immortal short story “The Lottery;” Annie Murphy’s haunting evocation of mother-daughter relationships, viewed through the lens of Jackson’s relationship with her own mother and The Haunting of Hill House; Asher & Lillie Craws’ lighthearted and perceptive examination of Jackson’s treatment of buildings and food in her fiction; and a tour-de-force silent interpretation of “The Tooth” by Maggie Umber. ABOUT NINTH ART PRESS– Ninth Art Press is a micro-press specializing in independent comics. Founded in 2011, it has published the anthologies Show and Tell: Comics About Teaching and Learning (2011), The Greatest of All Time Comics Anthology (2012), SubCultures (2014), and the first collaboration with Kirby, What’s Your Sign, Girl? Cartoonists Talk About Their Sun Signs (2015).